What: Travelling on the TranzAlpine - one of the most scenic rail journeys in the world, bubbling mud pools, steaming thermal waters, hiking to Kea Point to see Mount Cook, Lake Wanaka and Lake Hawea, Sky Tower, Kuirau Park, Ohinemutu Maori village, Wai-O-Tapu thermal wonderland, City to Sea Bridge, Weta Workshops, New Year's Eve fireworks in Wellington, Gormley statues, Earthquake damage, Arthur's Pass, Fox and Franz Josef Glaciers, Chalk Cliffs, Lake Te Anau, Rainforest at Lake Marian, Milford Sound and cruise, the place where the Bungy Jump was invented, world's windiest city. Wildlife spotting: Seals, Kea mountain parrot, eagles, hedgehog, wallabies, alpacas. Mishaps or illnesses: Feeling the sway and hearing the loud creaks of a hotel building on the move during a severe storm in Wellington. Internal doors moved on their own. 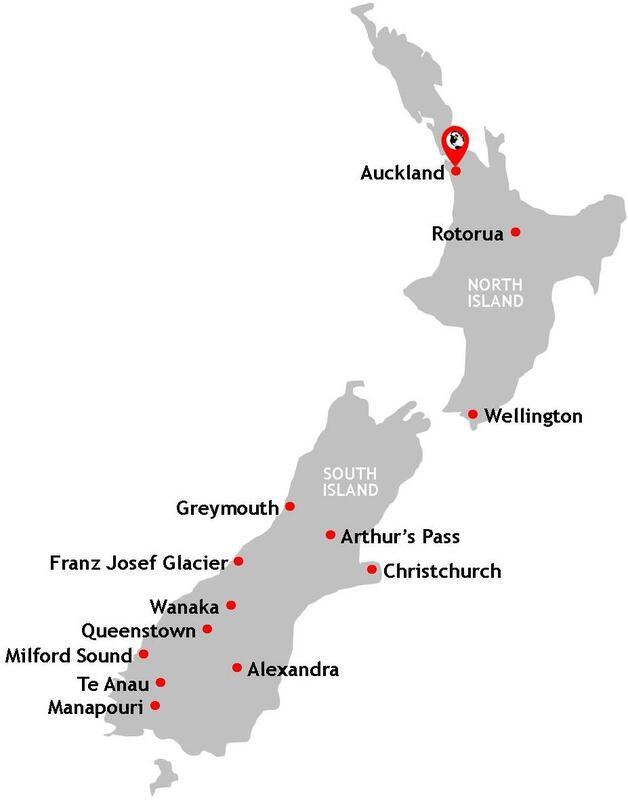 New Zealand (or 'Aotearoa' in Maori, meaning 'land of the long white cloud') is comprised of two main islands, the North and South. 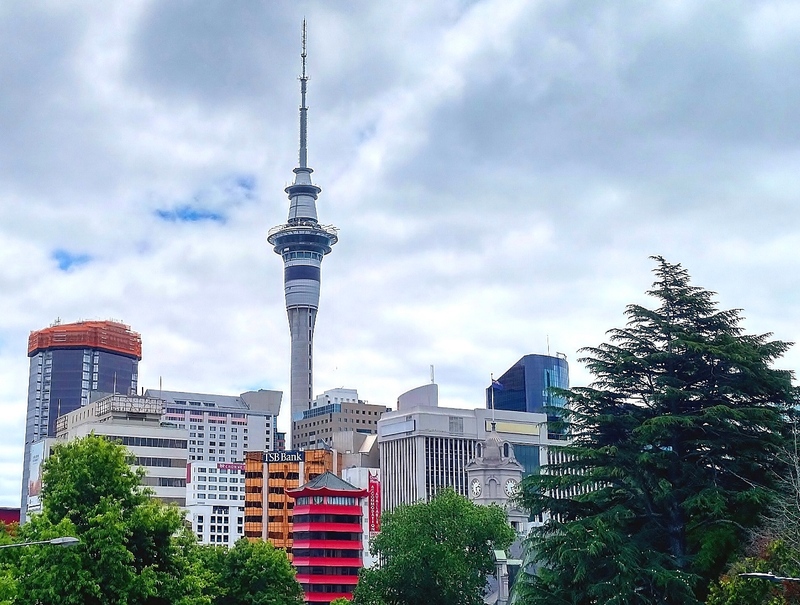 It's perhaps most famous for the iconic Kiwi bird, being the backdrop to a Lord and his Rings, for inventing the bungy jump and, more seriously, city-flattening earthquakes. Indeed, you're likely to come across the tsunami warning information film from 'Civil Defence' during advertisement breaks on television. These were repeated with such regularity that I became paranoid that we'd be washed away before the week was out (you can check out stills of this eerie film here). The film's closing message to viewers was, "Don't wait for an official tsunami warning siren - if it's strong and long get gone!" A menacing reminder, if any were needed, that we were now travelling in a volatile land resting on two shifting tectonic plates (more of this in my Christchurch section). New Zealand is the first country out of my new home Australia and my first real dip into the vast continent that is Oceania. Its sights - the things you definitely should ensure you've seen before departing - are scattered across all compass points of both islands. 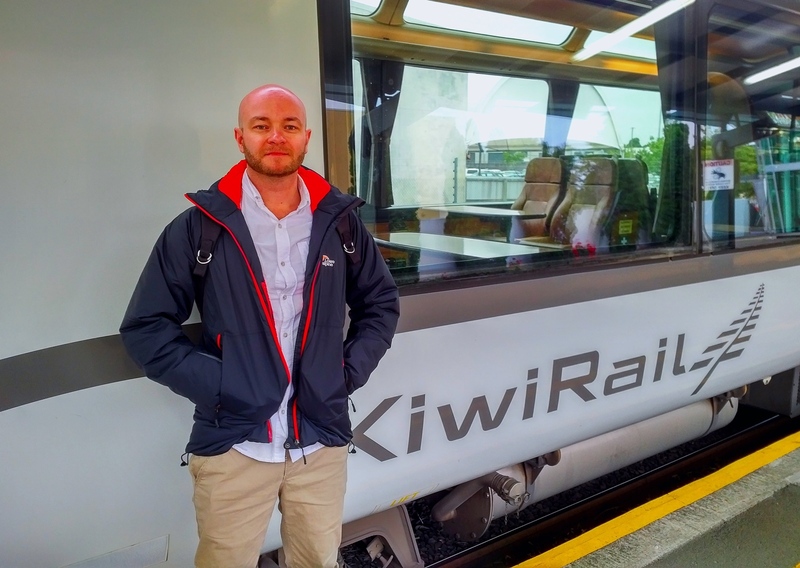 This meant that our Kiwi adventure needed a combination of coach, train, hire car and, unfortunately for me, three separate internal flights to cover the vast distances needed. New Zealand positively demands, therefore, that you travel through her: there'll be no parachuting in and back out of this country! We had two weeks to see as much as we could and tried to counter the exorbitant (and nigh-on exploitative) peak season prices by cooking evening meals in our room when the facilities were there and opting to buy our breakfast from local supermarkets rather than pay extra at the hotel to "upgrade". Kiwi country is certainly expensive. 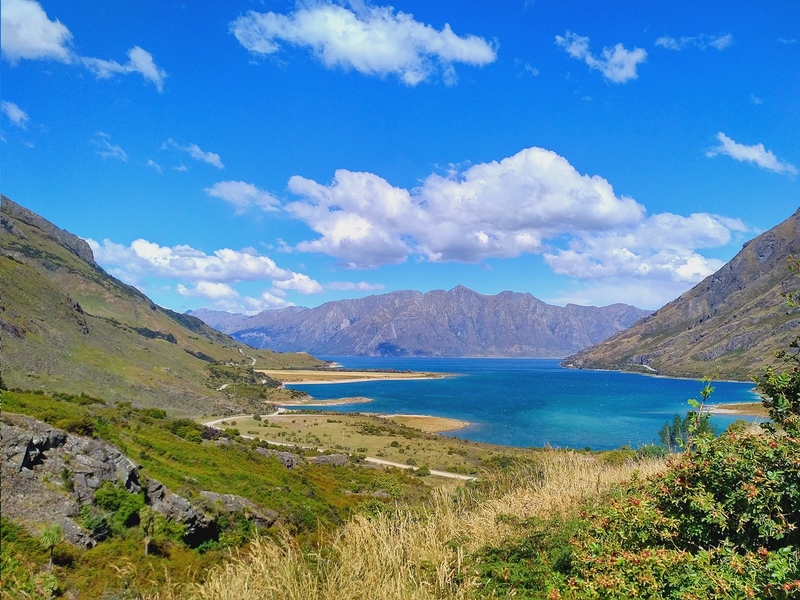 New Zealand is a land with a tantalising, and almost contradictory, mix of awe-inspiring snow-capped mountain ranges, humid and otherworldly jungle rainforests, steaming and bubbling geothermal landscapes, sparklingly blue Alpine lakes and...mediocre cities. Welcome to New Zealand, my 73rd country. 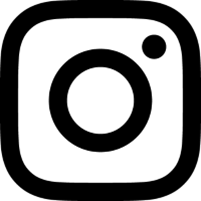 I am eternally optimistic because on so many occasions negative first impressions on arrival in a city have quickly dissolved after getting out and about; you quickly come across sights which have you reaching for your trusted travel cam. Auckland, the biggest city in New Zealand, although not its capital, does not make a very good first impression. Or second impression. Or third if I'm honest. Unfortunately, no matter how far we trundled along Auckland's streets, nothing improved and my usual open-mindedness quickly vanished to be replaced with deflation and then resignation. And then depression. I consider myself pretty adept at picking out the beauty of even the most ugly of places but Auckland pretty much had me snookered from the outset. The city is characterised by heavy, granite clad towers with black or gold reflective glass - the kind of buildings devoid of character, charm and architectural merit. This all-pervasive, functional style of architecture means that Auckland feels outmoded and outdated. I felt like I was in a low-budget version of Dallas. Sightseeing in Auckland, therefore, comes complete with some pretty emphatic inverted commas. The only thing remarkable about Auckland was its sheer soul-sapping unremarkability. The grey sky and drizzle served to exacerbate my despondency as did the many glum faces I saw on walkabout - all of which gave me the impression that Auckland is a place where people end up rather than choose to be. 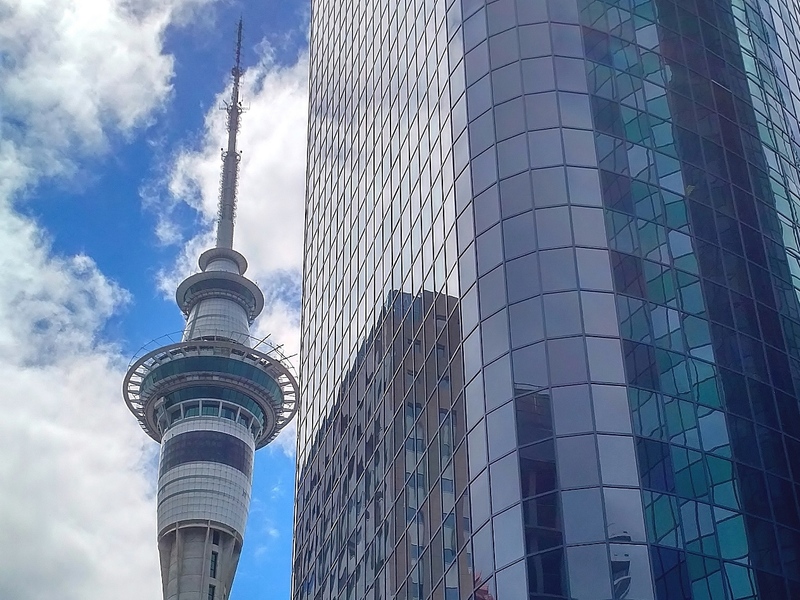 From certain angles Auckland looked positively Soviet with grey apartment blocks and a looming cosmic tower, the kind of concrete cityscape I have seen so many variants of in my travels around Eastern Europe. The two days we had earmarked to spend in Auckland rapidly felt ill-judged. If you're passing through then one day is plenty for any traveller. Don't re-route your itinerary to include it. Auckland City's one saving grace is the Sky Tower. At 328m it's the tallest freestanding structure in the southern hemisphere. As many of you will know, I have a bit of a thing for towers such as these ; they're extra-terrestrial and dramatic. Without it, Auckland would be at a complete loss as to how to differentiate itself from other cities. It is Auckland's one defining landmark and, as such, you'll find yourself magnetically drawn to it repeatedly as you traverse the city. It is unavoidable and inescapable; its silvery syringe-like shape stalks you on your walk and photobombs pretty much any photograph you can be bothered to take of the city's lego-like, blocky skyline. Surprisingly, when viewed from the Sky Tower's 220m high vantage point, Auckland looks pleasant enough. It's easy to forget from that height just how dull and uninspiring the city is up close. It is worth pointing out here that it is from this tower that fireworks herald the start of the Kiwi New Year - the first major city in the world to do so and, for this reason, is frequently featured in television news packages about New Year celebrations. To this end, I suppose you could say this structure is iconic on the world stage but only, I say cynically, because of New Zealand's proximity to the International Date Line. However, don't get too excited - this is as good as Auckland gets. Not much to see here, move along please (and quickly). Auckland's Sky Tower, the tallest freestanding structure in the southern hemisphere. The uninspiring skyline of Auckland. Nearly 250km south east of Auckland lies one of New Zealand's most famous destinations. We opted for the cheap and convenient InterCity coach service to the geothermal wonderland of Rotorua. The journey itself was nothing like what I had hoped for. Mystical vistas and mountain ranges were, in reality, retail parks, generic low-rise buildings and industrial units. I thought we had taken a detour through Milton Keynes but no, this was New Zealand's North Island. The only thing of note during this journey were the Maori place names tantalisingly pointing to 'Papatoetoe', 'Ramarama' and 'Matamata'. Indeed, the Maori heritage of this land was written in the faces of a fair few of my fellow coach travellers down to Rotorua that day. As we progressed on our journey southward, a depressing man-made landscape gave way to undulating hills, large green dollops of grass and a more rocky terrain. I wasn't to know it then but it was in Rotorua where New Zealand began to bear her fruit. Rotorua has the unfortunate nickname of 'Rotovegas' because of the sheer plethora of tourist-geared retail outlets and services. The central area of the town is crammed with garish themed backpacker hostels, shops selling tacky tourist trinkets you never knew you wanted and travel agencies promising everything from shuttle services to amphibious boat excursions. If you want to fly in the skies on a zip line whilst attached to some Kiwi birds and drinking a mocktail you could probably find someone here to sell it to you. Despite this I infinitely preferred Rotorua to Auckland: it is the gateway to a more mystical and naturally spectacular part of the country. 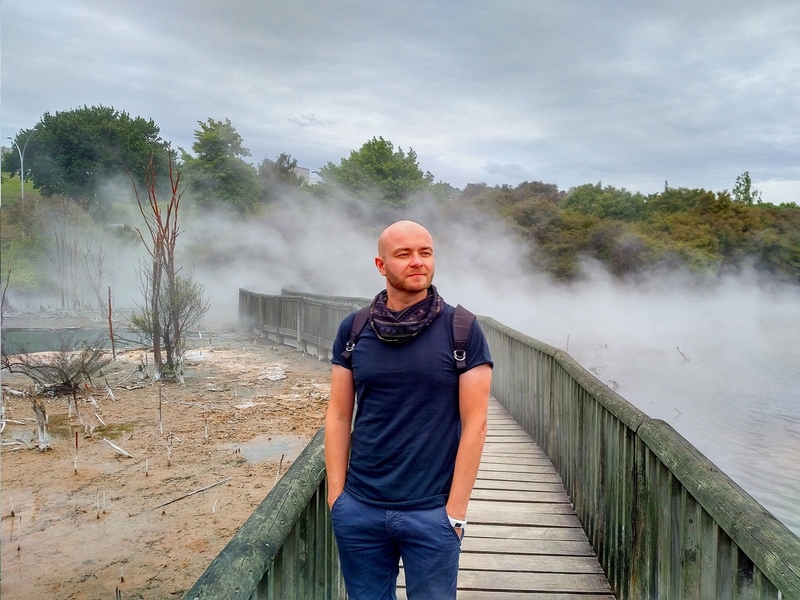 Indeed, a walk around the edge of town brought us face to face with bubbling mud pools and steaming landscapes - all a product of the geothermal volcanic activity in this part of the world. It's pretty amazing to witness: this is Mother Nature doing her thing, unrestrained and uninhibited. Our ramble along the route unexpectedly led us to Ohinemutu Village, a traditional Maori settlement complete with meeting house ('tama te kapua') and community dining hall ('whakaturia'). An assortment of ornamental and, quite frankly, fierce-looking masks adorned doorways and land posts (pouwhenua), and all the while geothermal steam bubbled out from fumaroles giving the whole place a mystical spirituality. All of this steamy geothermal activity was a prelude to our trip out to Wai-O-Tapu the following day. I didn't know it at the time but what we'd seen so far would pale into insignificance when we got to Wai-O-Tapu. I was initially sceptical about this self-billed "thermal wonderland", the very phrase suggesting Disneyfication and touristic candy floss - the like of which I am programmed to instantly recoil from. My cynicism was unfounded and the language used was not, thankfully, marketing hyperbole. Wai-O-Tapu (which means 'sacred waters' in Maori) is eighteen kilometres of volcanic, geothermal land punctuated by collapsed craters, boiling pools of mud, steaming fumaroles and a geyser which erupts every day or so. The otherworldly experience is intensified by the range of colours which decorate this lunar-like landscape, a consequence of minerals like sulphur, silica, antimony, iron oxide and carbon. The geothermal marvels at Wai-O-Tapu are given evocative names like 'Devil's Bath', 'Devil's Ink Pots' and 'Artist's Palette'. The 'Champagne Pool', with its electric orange rim and mesmeric steaming waters, is a truly remarkable sight, as is the luminous green watery crater of the 'Devil's Bath' - the result of colloidal sulphur and ferrous salts. 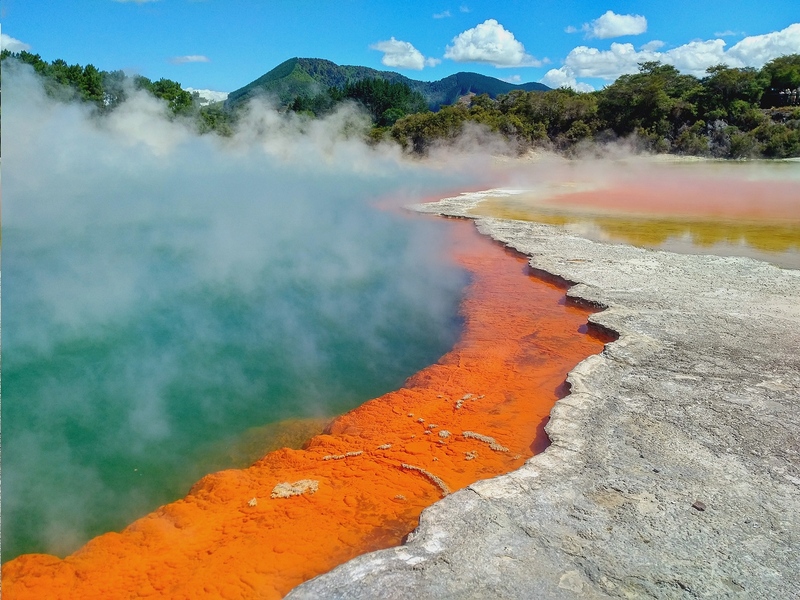 Wai-O-Tapu is an assault on the senses - the colours, the heat and the smells. 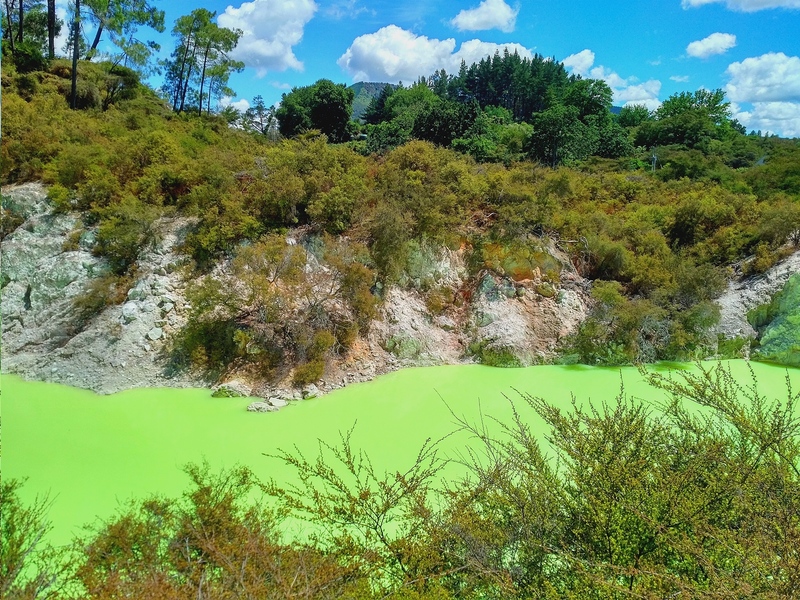 Indeed, the thick eggy stink from the bubbling sulphur pools gets nostrils flaring all over Rotorua. I felt our adventure in New Zealand, which had got off to such an unappetising start in Auckland, was now well and truly back on track. Kuirau Park in Rotorua is full of steam and stench. Quite fun walking through the geothermal steam on this bridge. 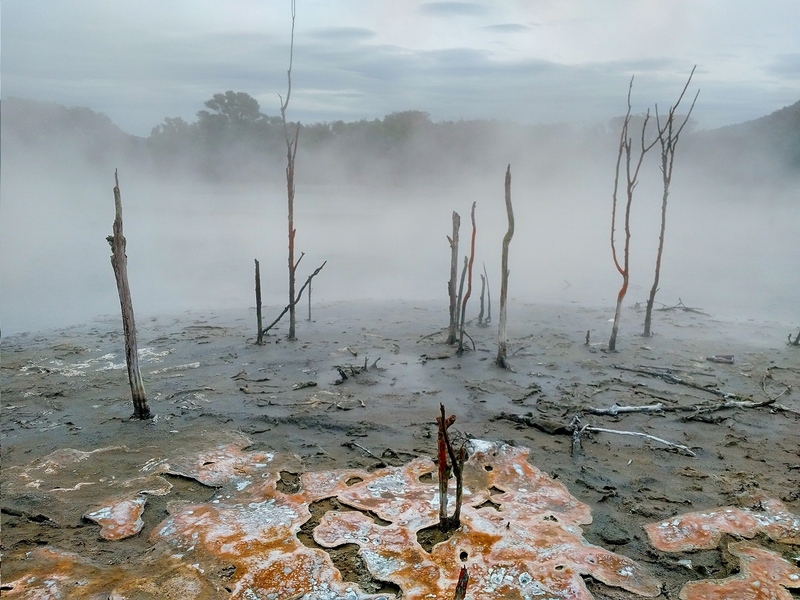 The otherworldly appearance of Kuirau Park: steam, sulphur and scorched branches. The stunning Wai-O-Tapu Champagne Pool. The orange colour originates from deposits of arsenic and antimony sulfides. Almost Sci-Fi. The green sulphur waters of the Devil's Bath. As you might expect being the Kiwi capital, Wellington is far easier on the eye than Auckland. Unbeknown to me it also has the unenviable title of being the windiest city in the world - a fact that was brought into sharp focus in our twelfth floor hotel room, a building located along one of the city's wind tunnels. The swaying of the building on its bearings, an anti-earthquake design feature, caused the tower to creak and groan as well as sway from side to side. Seeing internal doors move on their own was a rather unsettling experience and soon caused us to switch rooms to something much closer to the ground floor. Wellington is walkable and feels planned and considered. Buildings live together harmoniously rather than fighting against one another in a heady architectural mess as in Auckland. After Auckland I was beginning to think that Kiwis didn't 'do cities' very well - after all, New Zealand is most famed for its outdoors, not its cities. However, Wellington reassured me otherwise in spite the strong wind and heavy rain we experienced whilst there. New Zealand's Maori name 'land of the long white cloud' was quickly proving accurate. The day before our arrival in Wellington a 5.5 earthquake struck just off the city's coast. This paled into insignificance when compared to the massive 7.8 which struck there the previous month. Evidence of the damage shifting plates have wrought on the Kiwi capital is visible and particularly obvious to the observant traveller. Firstly there are the closed shops in its shopping districts. A closer inspection of the explanatory notices affixed to their windows from the inside spells out the real reasons for this "until further notice" closure. There are other signs too, like those from the city council notifying proprietors that theirs is an "earthquake prone building", giving them ten years to strengthen it or demolish the building altogether (we chose not to eat in that particular restaurant having spotted the notice alongside the eatery's menu). Then there were the blue markings cutting across roads demarcating an area as a "tsunami safe zone". I also couldn't help but notice that our hotel was littered with sizeable cracks and broken plaster around windows and doors. Of course, buildings in New Zealand are constructed with all sorts of earthquake-proof measures which allow them to move safely during earthquakes and thus protect them from collapse. These cracks, therefore, were nothing more than superficial but did, nevertheless, act as a sobering reminder that we were travelling in an actively volatile country. Following the 7.8 quake in November a number of buildings in the capital have been closed, their structural integrity undermined to such an extent that it is no longer safe for people to be inside them. Indeed, the main 'i-site' tourist information building, only a few years into its life, stands forlorn with yellow "CAUTION" cordon tape and metal fencing surrounding it, like some kind of heinous CSI crime scene. Other buildings in the city were being demolished altogether. Heralding from a quake-free country I found this is all rather fascinating and frightening. Rather than playing the victim, Wellington feels like a cheeky upstart populated, as it is, with some of the most ridiculous, quirky sights I have ever seen in a city. There is the giant umbrella on a corner of the hip Cuba Street and the wonderfully bizarre kinetic fountain made of tipping buckets painted in primary colours. It clumsily (and probably deliberately) splashes shoppers as they walk by! We also saw in the New Year with thousands of Kiwis at Jervois Quay watching a band play pop songs through the ages until the stroke of midnight when a firework display erupted from behind the stage. It wasn't exactly London's South Bank or Sydney's Harbour but it was, pleasantly, on a far more human scale with no tickets required, no exorbitant entrance fees, no drunken idiots spoiling it for everyone else and no terror threat - all of which made it infinitely preferable in my opinion. Surrounding buildings had distinctive Maori swirl patterns projected onto them which, I felt, was a lovely, inclusive touch in a country where indigenous and subsequent settlers appear far more integrated than back home in Australia. 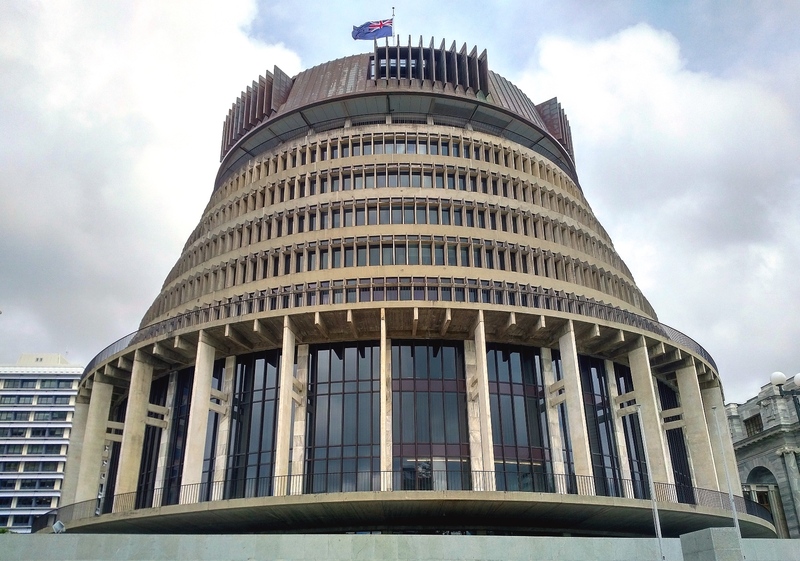 The Beehive building - a part of the New Zealand Parliament and includes the Prime Minister's office. 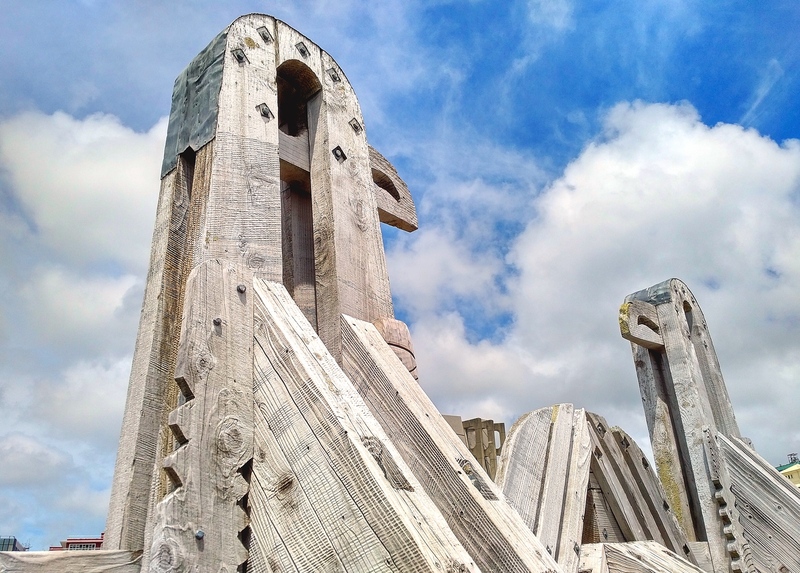 The unusual Sea to City Bridge designed by prominent Māori artist Paratene Matchitt. After 48 hours in Wellington we caught our second domestic flight of the trip and our first taste of New Zealand's South island: Christchurch. The city has an ominous nick-name: 'Quake City'. It's a nickname I'll avoid using too often as I am sure the people of Christchurch do not want to be permanently branded by the devastating earthquakes of 2010 and 2011 although, to be honest, having visited the city, it's hard to see how it could be otherwise. Buildings stand abandoned, many held up by steel props, others demolished completely and the land used, temporarily at least, as vast car parks. The earthquakes of 2010 and 2011 are still a hot topic around town: in taxis, on trams and in the streets. In places Christchurch feels like one huge car park, many of which have had giant murals painted onto adjacent buildings in a bid to inject some temporary colour back into the city. Other locations, once home to churches and other historic buildings, have been given over to community-based projects and art installations. I'd love to be able to say at this point that destruction has spurred on a superb arts scene in a kind of phoenix and ashes scenario but, alas, it just doesn't feel this way. In reality, the murals and installations feel contrived and incongruous. Their colourful, optimistic freshness jars and offends; it's the artistic equivalent of dropping over-sized, colourful jelly babies on to ashen waste ground. This is not to undermine their individual merit but they just cannot compete with the degree of destruction which surrounds them. Five years on from the devastating quake, Christchurch is still very much on its knees. The city's Anglican Cathedral is, perhaps, the saddest tale of all. Its tower and steeple have been lost entirely. A giant steel support put in place to protect the beautiful stained glass window following the earthquake of 2010 merely acted as a giant battering ram in the 2011 quake - ironically ensuring the treasured window's absolute and permanent destruction. The Anglican Cathedral now has a Transitional Cathedral a few blocks away, cheerfully dubbed the 'Cardboard Cathedral'. Constructed with ply wood and plastic materials it's actually inspiring and beautiful inside - modern and refreshing and, perhaps, a symbol that out of disaster can come opportunity and a chance to improve upon what went before. In a similar vein, an entire shopping area, appropriately named 'Re:START', has been created using metal shipping containers: a corrugated lego city of primary colours and a stroke of creative genius. Like the Cathedral it is functional and temporary and, arguably, far more interesting than its predecessor. Quake City's need to reinvent and recreate in its time of adversity ensures it is the perfect destination for travellers in search of something unique and unusual as well as those travellers interested in a bit of 'dark tourism'. Tied to seemingly miles of corrugated metal hoardings screening off the collapsed and the destroyed are artists' impressions of what replacement buildings will look like - computer generated representations of Christchurch's future. Ironically, this was one aspect of Christchurch which I found to be most worrying of all. These glimpses into the city's architectural future painted a picture of off-the-shelf constructions of the glass and metal variety so ubiquitous in every city in the developed world. This is the architecture of the capitalist, the money maker - not that of culture, history, character or that which seeks to reforge an entire city's identity following the devastating natural events. 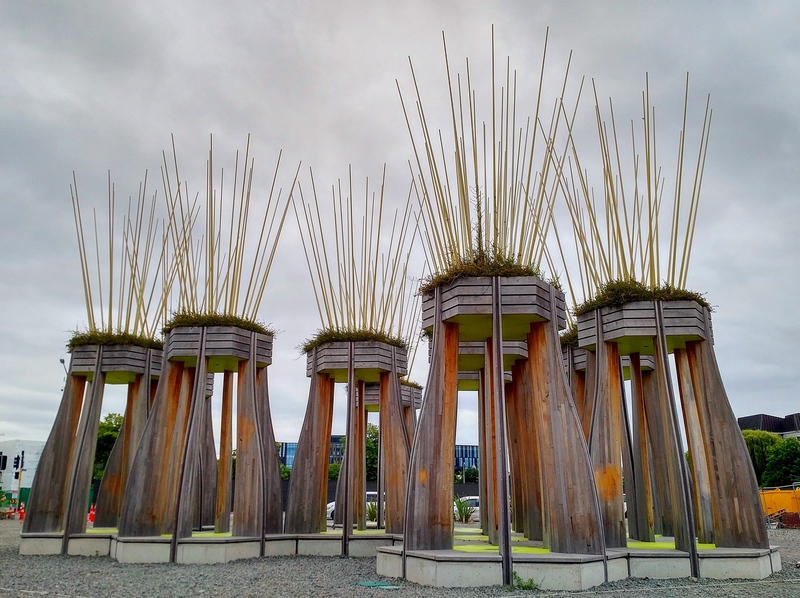 If Christchurch isn't careful, in the rush to rebuild and get back to normality, rather than building itself out of disaster, it will merely cement the memory of the quakes through a legacy of uninspiring, generic architecture. Only time will tell. Christchurch was only on our itinerary because we wanted to travel on the famous TranzAlpine railway west to Greymouth. It ended up being one of my most surreal travel experiences to date. Quake City is an urban dystopia reminiscent of my time in Detroit; a post apocalyptic world of broken buildings and eerie emptiness (granted, I visited the city on a public holiday which, I'm sure, partially explains this). Christchurch is not most people's idea of a destination but is most definitely mine. Christchurch Art Gallery. 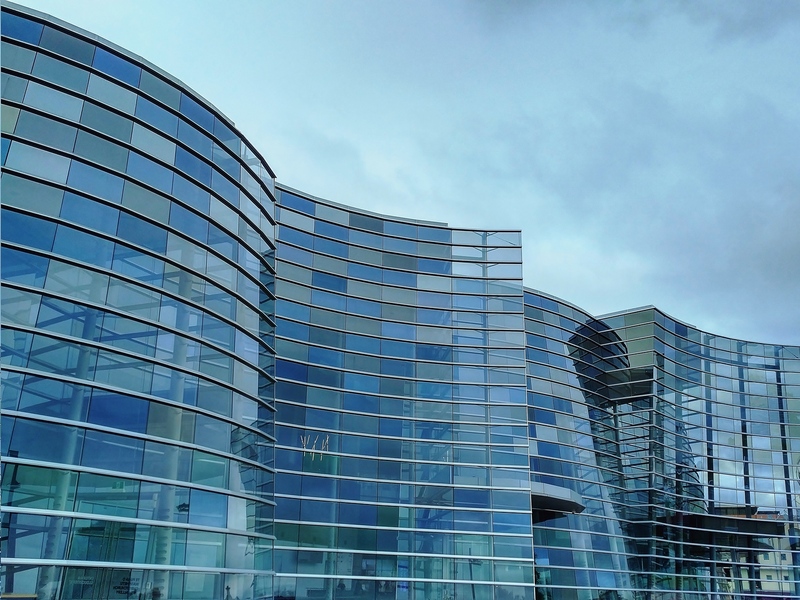 Not one of its 2000+ panes of glass were damaged in the two most recent earthquakes. Art installations do their best to detract from the devastation but just can't compete with the lingering sense of dystopia which pervades. 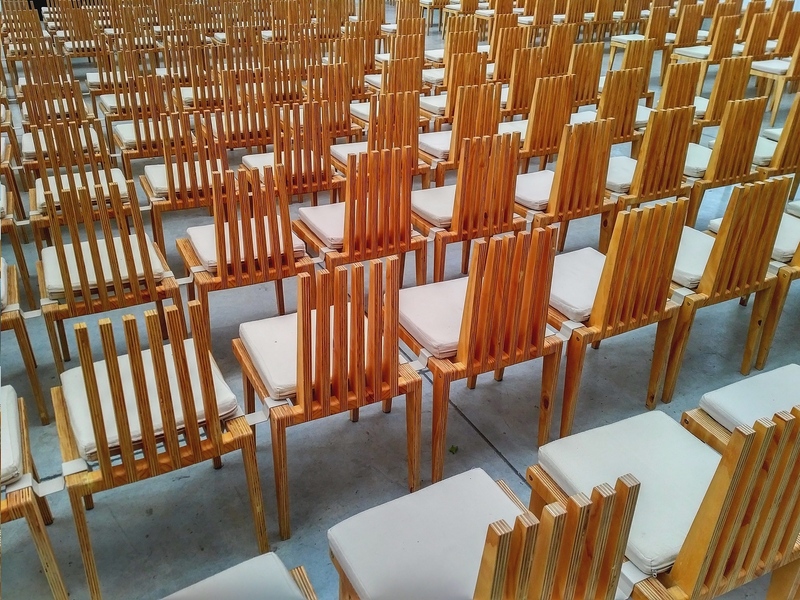 Satisfyingly geometrically-positioned chairs inside Christchurch's temporary Cardboard Cathedral. There's something evocative and romantic about train travel which, I think, no other form of transport can match. The TranzAlpine is one of Kiwi Rail's scenic rail routes. Its 230km of track snakes from Christchurch on the east coast to Greymouth on the west - and here's the most important bit - through the mountainous spine of New Zealand's Southern Alps. It's considered by many travellers and travel bloggers to be one of the world's most scenic train journeys and one of the things to experience before you die (who decides what goes on these lists anyway?) The landscape switches between the flat Canterbury Plains to rocky valleys with serpent-shaped metallic blue rivers and, as the train enters its final leg of the journey, the landscape becomes swampy and Jurassic. We boarded on a particularly bad weather day which, contrary to expectations, made the scenery all the more dramatic as clouds hugged mountain ranges giving the scenery a mystical, magical quality. At one point the train positively cut through the low-lying clouds. An open-to-the-elements carriage allowed me to get up close and personal with the landscape I was travelling through: the watery spray of the rain; the scented smell of purple and lilac lupin flowers; the biting cold nearly 800m above sea level. It's an exhilarating and immersive experience - and the perfect escape from the claustrophobic and smelly carriages which increasingly reeked of food, alcoholic beverages and human odours. Setting off on KiwiRail's TranzAlpine from Christchurch on the east coast to Greymouth on the west. Alpine scenery as seen from the outside viewing carriage: rightfully judged to be one of the most scenic rail journeys in the world. After coaches, internal flights and mountain railways the final leg of our journey around New Zealand was made possible thanks to the hire car. 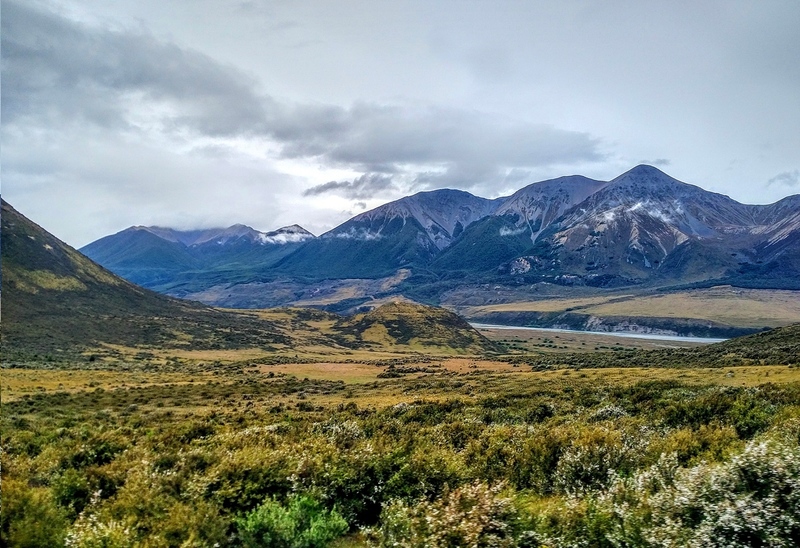 The very nature of the South Island pretty much dictates driving as the only feasible method of seeing this wild and spectacular portion of the country - especially if your time is tight. It's that or hitch-hike. The words "stunning", "wonderful" and "beautiful" are much overused in travel writing and, in many cases, misapplied. I always try hard to avoid this kind of travel blog cliche but, in the case of New Zealand, the words are more than apt. Indeed, the further south in New Zealand we travelled the more beautiful and awe-inspiring it became. I firmly believe that beauty can be found in any country should you wish to look for it. You have to look harder in some places than in others but it is there. In New Zealand, however, you don't have to look very hard. The diversity of its natural wonders is beyond anything I have ever seen. Indeed, travelling through New Zealand rekindled travel memories from countries as varied as Iceland, Turkey, Scotland, the United States and Switzerland. New Zealand is a place where the size of things is magnified, where the colours are maximised and where the quantity of things is multiplied. Beauty cubed. Basing ourselves in the sleepy village of Whataroa and then the townships of Alexandra and Te Anau, we set out to see the South Island's most incredible natural wonders, starting with a hike through the Westland Tai Poutini national park, itself photographically-worthy with its vistas and waterfalls, to see the Franz Josef Glacier. Having hiked on, and abseiled up and down, glaciers in Iceland we didn't feel the need to go hiking on this particular block of ice - nor the taking of the obscenely extravagant option of flying over it in a helicopter (New Zealand seems to want to flog helicopter rides to tourists like they're going out of fashion). 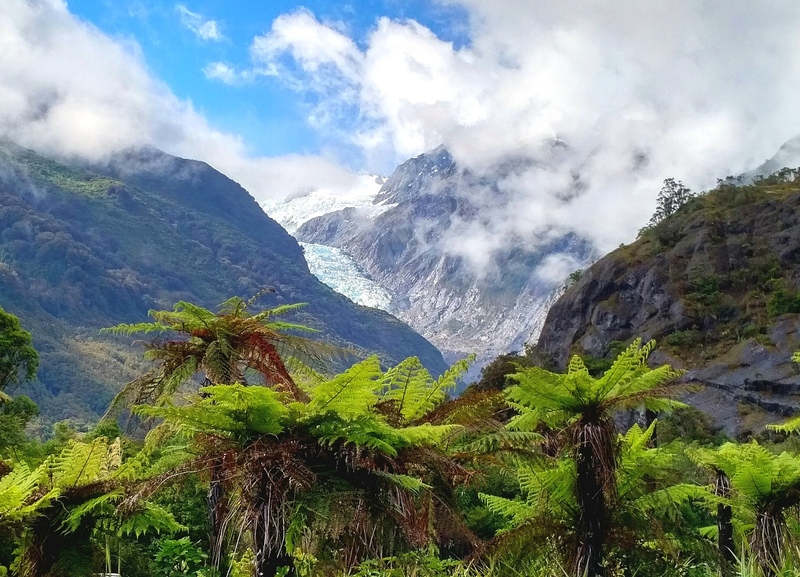 As it was the glacier was a great sight - especially when juxtaposed with the tropical-looking fern trees in the foreground (yes, tropical ferns and icy glaciers in the same place!) Our drive southward along the West Coast took us past the dazzlingly blue Lake Wanaka and Lake Huwea. Our next stop involved a slight detour west to Omarama to see the Clay Cliffs, tall pinnacle rock formations, with a blue hue, which cut a jagged outline against the sky. Their strange shapes conjured up memories of the Fairy Chimneys I had seen in Capadoccia in central Turkey. A little further southward took us to the snow-capped Aoraki mountain range (more commonly known as Mount Cook). A hike through to Kea Point gave us the best possible side-on view of the famous mountain without the need to undertake a serious mountain expedition in the footsteps of Sir Edmund Hillary! Further southward into Fiordland at Te Anau brought us tantalisingly close to the majestic Milford Sound (Piopiotahi), an iconic composition of interlocking mountains and the highlight of many a person's visit to New Zealand's South Island. We arrived early to avoid the tourist hordes who we knew would be winging their way on scores of coaches from 8am onward. We took a two hour cruise to get up close an personal with this famous fiord's waterfalls and seals but, perhaps ironically, I managed to capture a stunning photograph of Milford Sound from the car park. It is, quite arguably, the best photograph I have ever taken: the purple moodiness of the peaks are reflected perfectly in the fiord's morning tide. This just goes to show that often the best views to be had are ones that are free - no need for expensive helicopters or even the considerably cheaper boat cruise. Our scenic return drive back from Milford Sound included stop offs at The Chasm, the Mirror Lake and a walk through the gobsmackingly beautiful rainforest and alpine lake of Lake Marian. The Franz Josef Glacier foregrounded by the ever-evocative fern trees in the Westland Tai Poutini National Park. 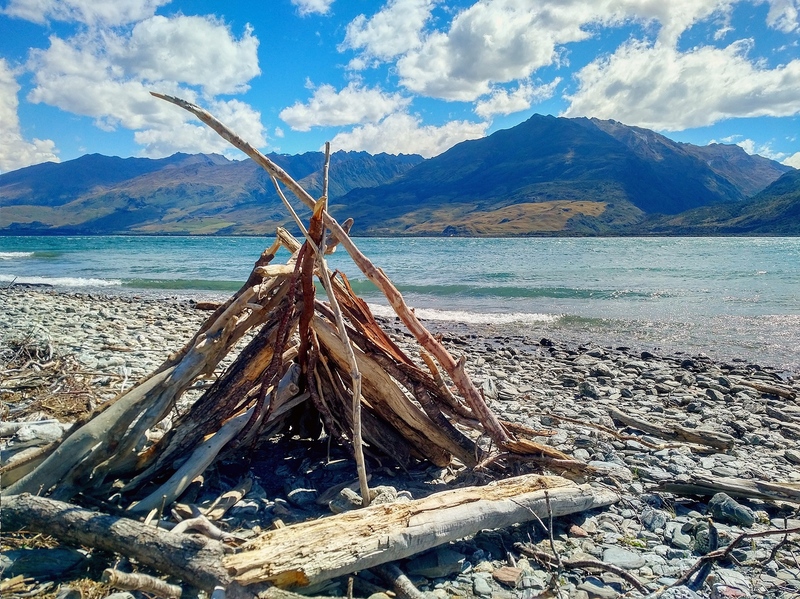 The crystal clear blue waters of Lake Wanaka with driftwood stack. Lake Hawea in the Otago region. 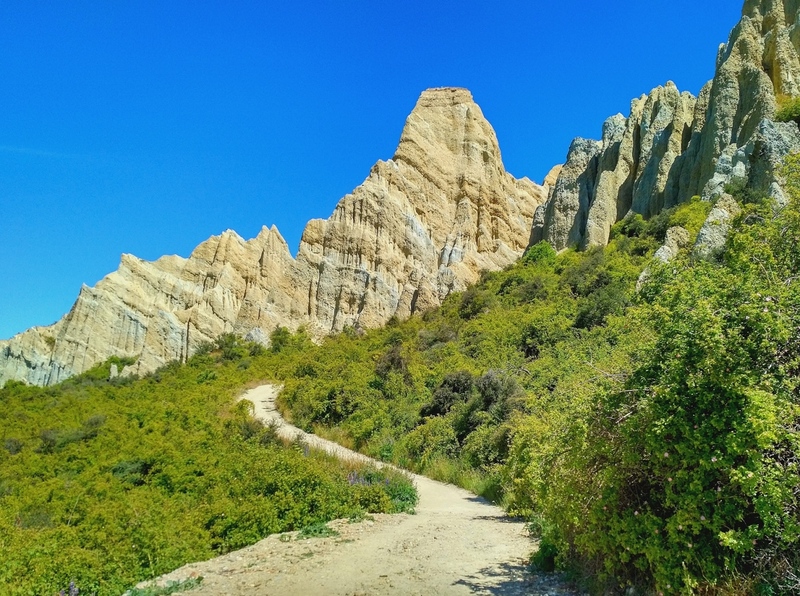 The giant fluted Clay Cliffs at Omarama. I love the subtle blue hues to some of them and the inviting winding path leading up to them. In front of the Mount Cook / Aoraki mountain range amid the colourful lupin flowers. The purple moodiness of the iconic Milford Sound is reflected in the fiord's morning tide in New Zealand's Fiordlands. New Zealand is one of those countries where being all Bohemian and rocking up to hotels, motels and hostels asking for a bed for the night just won't work. Accommodation is at a premium in smaller places - especially during peak season. Our shuttle bus driver out to Wai-O-Tapu took pity on two customers the previous week who had arrived in Rotorua to discover there was not a bed in the entire town. She took them home and they stayed at hers for the night! Book several months in advance - those travellers who take the time to plan are the ones who can sleep soundly at night - literally. New Zealand is all about the countryside and landscape. Plan to spend a little less time in the big cities and a little more getting out an about. Not to sound alarmist but it is circumspect to brief yourself on what to do in an earthquake situation. Earthquakes do happen here. Indeed, a 5.5 occurred the day before our arrival in Wellington. Earthquake-hit Christchurch has a distinct lack of accommodation for obvious reasons. Significant hotel chains in the city have had to vacate their compromised buildings. Book early. New Zealand's weather is notoriously changeable, even in the summer. To prevent yourself having to head to the nearest outdoor shop for a thermal jacket (like I did - a snip at $200) pack accordingly. Listen out for the way Kiwis mix their vowels; it is the most distinctive aspect of their English pronunciation and very different to their nearest neighbours the Australians. The most spectacular views on the TranzAlpine, travelling from Christchurch to Greymouth, can be seen on the right hand side of the train. Get your spot in the outdoor carriage early as it soon fills up with people. Book directly with KiwiRail here. If you're driving around South New Zealand make sure you research where and when you can fill up. Petrol stations are few and far between and there is a real risk of you running out of fuel before the next fill up point. Wifi is free in hotels but often comes with a miserly limit. It's a practice I've not come across before but is very en-vogue in New Zealand. Free wifi is advertised but limited to half a megabyte per 24hrs. Very frustrating. If wifi is important to you, check first what "free wifi in all areas" actually means in practice. In NZ it is likely to mean very little. 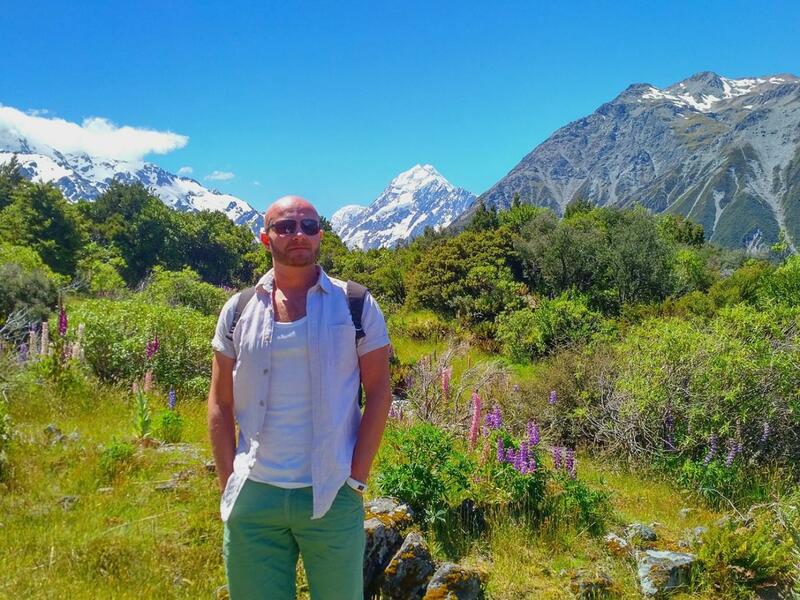 Milford Sound is a tourist magnet. Scores of coaches make their way there from Queenstown and Te Anau from around 8am onwards. 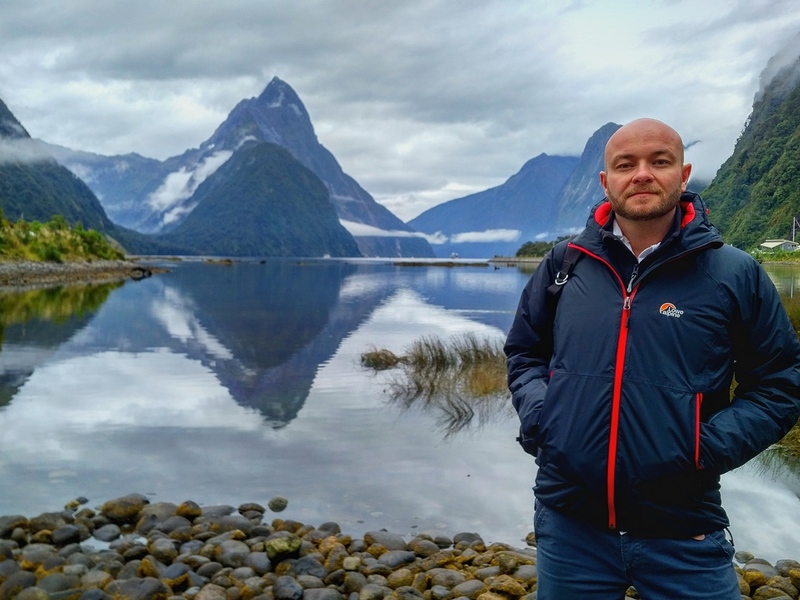 Avoid the traffic and have a little bit more peace and quiet at Milford Sound by setting off an hour or so before the selfie stick-wielding hordes descend.